My wife and I purchased a copy of “Sound of Music” when the 40th Anniversary edition was released. The only previous time seeing the movie was as a boy, so the history told within the movie went completely over my head. I only remembered the popular children’s songs (“Do-Re-Mi,” “My Favorite Things,” etc.). This time, I was completely enraptured, having visited Salzburg in 2002, recognizing a number of the city’s monuments, and knowing a lot more about Austria’s history, particularly since the dissolution of its empire. I shivered when I saw the march of Nazi troops across the front of the Salzburg Cathedral. I was moved to tears when Captain von Trapp sang “Edelweiss” at the musical competition. I did not previously understand the significance of that song (a regional hymn commonly sung in Austria and southern Germany) nor the emotions within the performance (as a boy, I understood running away from the Nazis and all that but did not understand that the man was eulogizing his homeland). 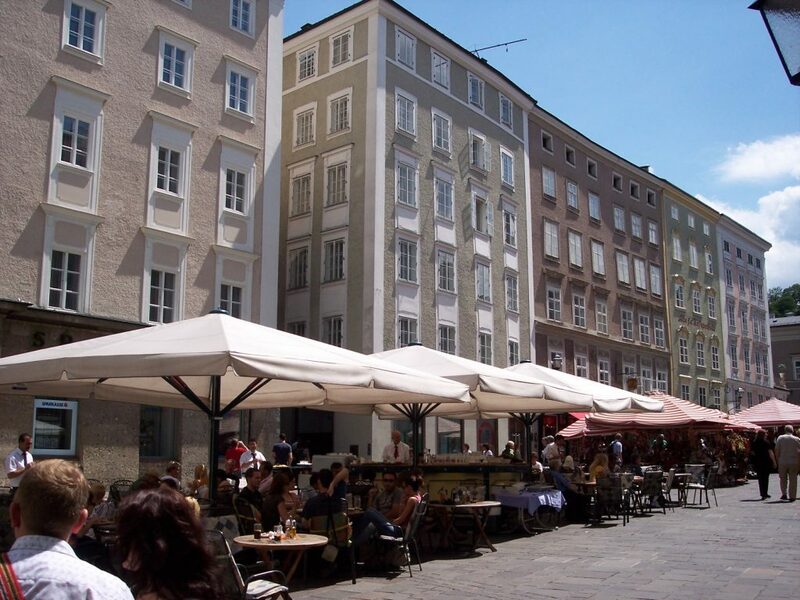 After my second trip to Salzburg in 2008, I made it a point to re-visit some of the locations in Salzburg’s old city, or Altstadt, that I glossed over. Salzburg’s Old City stands on the south bank of the Salzach River beneath the Hohensalzburg Castle. It is like several other Austrian old cities I have visited, generally circular or half-circular in shape with a high wall of buildings facing the river and the inner roads arrayed a circle around a central plaza and/or main church or Cathedral and/or palace. The Salzburg Cathedral, shown in both the first and second photographs, and the Salzburg Residenz form the centerpiece for this city. The two face toward each other, but are offset so each has its own plaza with fountains and marketplaces. The Residenzplatz hosted an ice skating rink when I went. 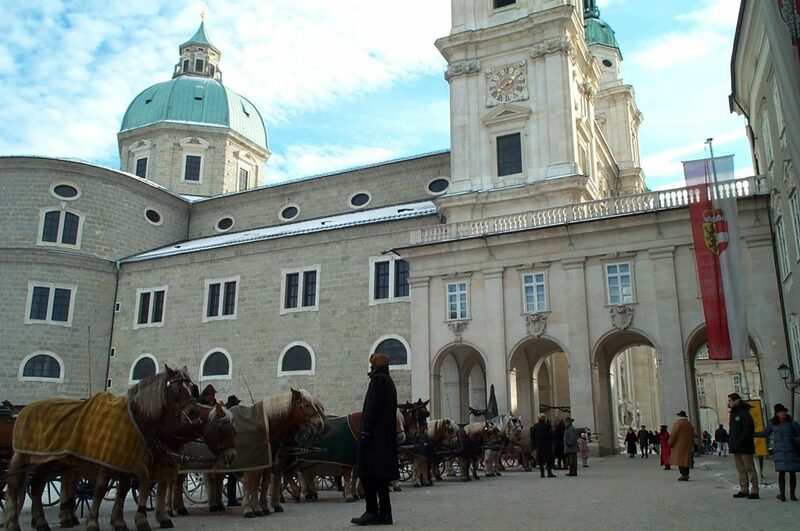 As the second photo shows, the Residenzplatz was also where one can hire a horse carriage even in the dead of winter, although obviously business during the colder months is comparatively slow. The interior of the Cathedral is very impressive and unmistakably Austrian — white with lots of red marble, gilding, and gorgeous artwork. Unlike other Cathedrals, however, the organ is located towards the front of the church rather than at the back above the mezzanine. I had the pleasure of listening in on a small choir rehearsal when I was there, roughly six shivering musicians huddled together with the organist singing beautiful melodies over the magnificent altar. It was from the Cathedral that I went up to the Castle, down to St. Peter’s Abbey (whose cemetery was used in “Sound in Music”), and resumed my downtown tour further to the west. 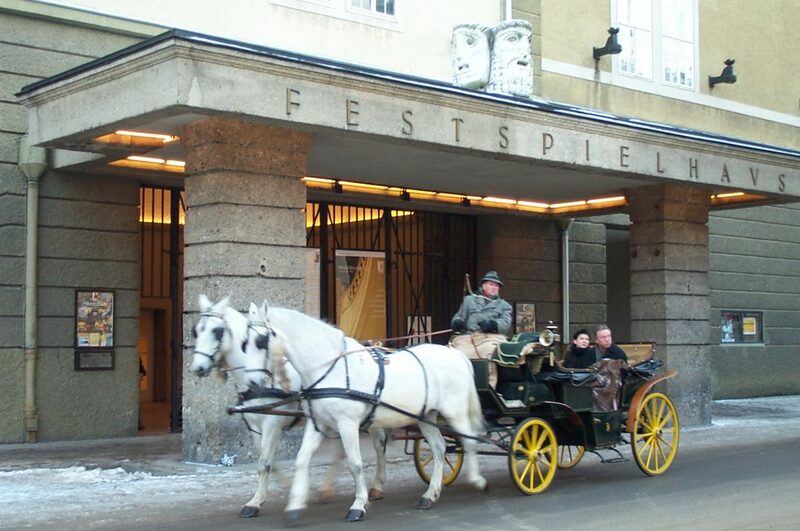 The third photograph shows the Festspielhaus, one of the city theaters (and Salzburg has a number of city theaters and opera houses). This structure is built against the base of the Moenchsberg, the tall rocky hill upon which the Hohensalzburg sits. Not far from there is Salzburg’s pedestrian zone covering several blocks. 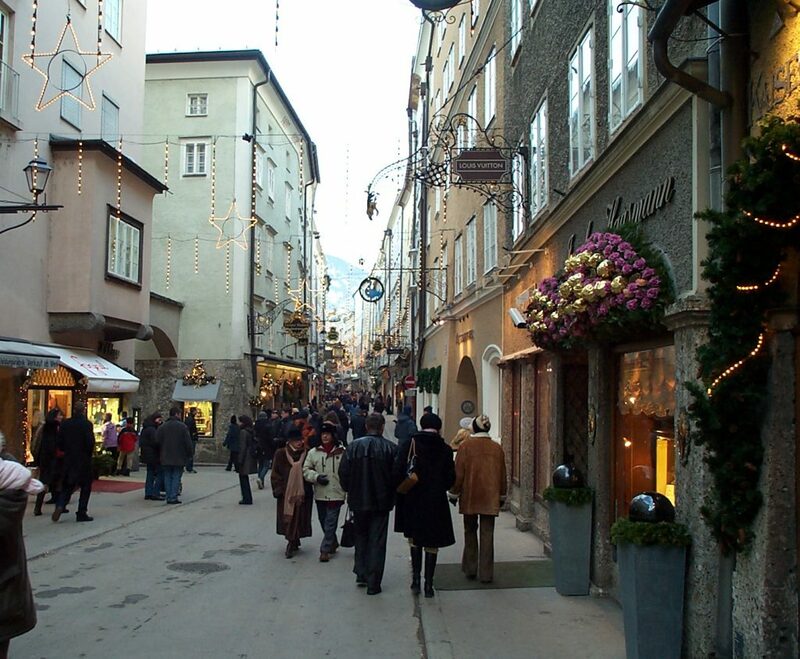 The first photo is of main specialty shopping street, the Griedegasse. This street extends several hundred meters across the narrow western part of the city. Although this picture does not show this well, the city’s Christmas street decorations were out in abundance, as were the crowds. Along with the usual trappings — neat stores, restaurants, etc. — were a couple local pretzel vendors on the street. These pretzels were large enough to be a meal unto themselves! I barely finished one. The photo below is a wintertime shot of the street with much of the Christmas decorations still up (it was right after New Year’s before the Epiphany). As the sun went down by about 4:30PM the lights were beautiful — too bad my original digital camera did not do nights very well (would love to go back with a more modern camera during their famous Christmas Market)! The next photo is a summer shot is of the Altermarkt, which is closer to the Dom. The Altermarkt is one of several market squares in the downtown that cater to tourists. I also believe several conservatory students lived in some of the apartments above as I heard the sounds of musicians practicing from several windows. The “Sound of Music” is not the only entertainment that Salzburg is famous for… there’s also Mozart. 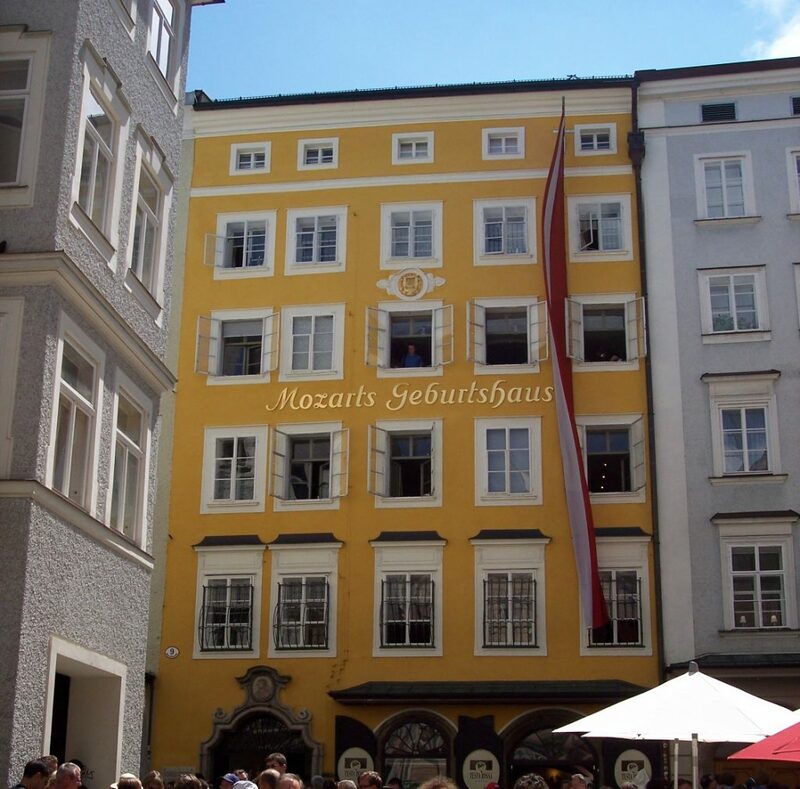 The Mozart theme was pervasive there — from the big Mozart statue to Austrian chocolates advertising Mozart to the stylish museum called “Mozart’s Geburtshaus” (birthplace). This museum may have been a tourist trap, but it was a really good one. I felt like it portrayed lifestyle in Salzburg during that era and it devoted plenty of space to explaining Mozart’s rise to prominence as a musician writing compositions for use in the church and his career. The museum sits only a few doors away from the Salzach River, and its golden color (as seen in the fifth photograph) made it an easy thing to find. 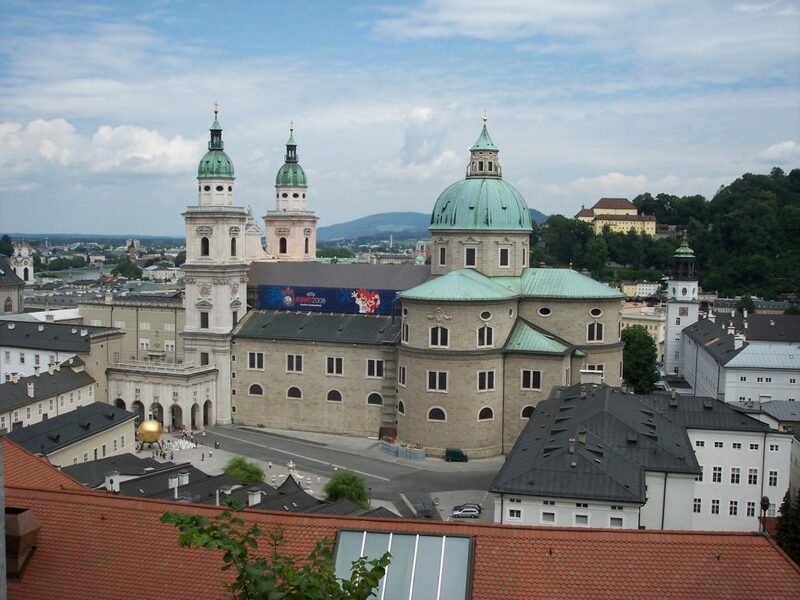 The next morning I returned early to the downtown to attend Mass at the Salzburg Cathedral. It was beautiful and sunny, and the Cathedral was full of parishioners and of music. I don’t know if it was the same choir, but they were terrific in any case. The classical heritage of Austrian music is very much alive.